Very popular class for classic cars such as Formula Vauxhall and older F3 cars, like Reynards and Ralts. 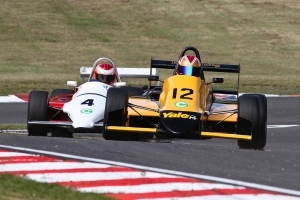 Trialled in 2007 as a Cup, and introduced as a new formula in 2008, Mono 2000 Classic has become on of the most popular and competitive classes. F3 Chassis of carbon fibre or aluminium for 1992 & earlier cars. Standard production engines up to 2000cc capacity, or restricted F3 engines from 1992 or earlier . Dry sump lubrication permitted. Carburettors or original spec fuel injection.